Having called Dubai home for a few years, I have been asked countless times what are the things to do and see if one visits Dubai. 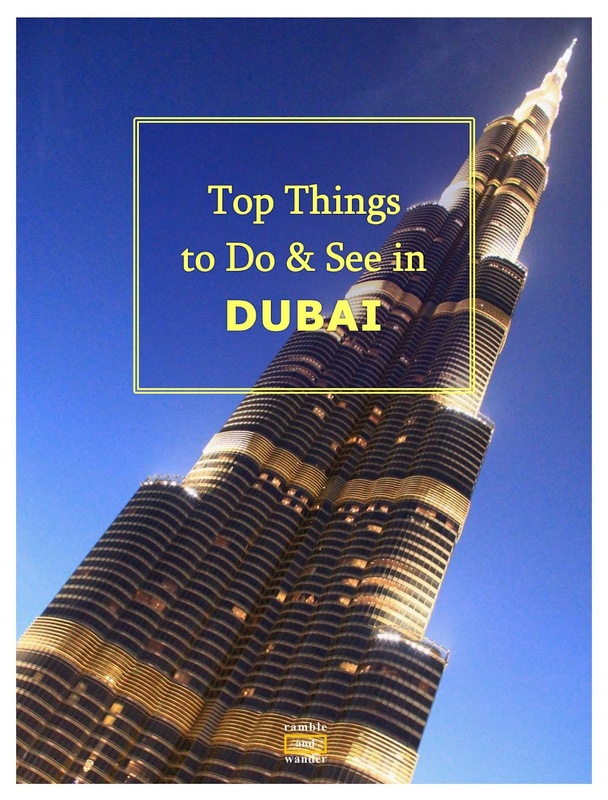 The following is thus my personal list of top things do to and see in Dubai, United Arab Emirates (UAE). Burj Khalifa. The tallest tower in the world. 828m. Almost twice the height of Petronas Twin Towers in Kuala Lumpur, which held the same record for a period from 1998 to 2004. Crazy? Probably. You can see Burj Khalifa from almost anywhere in Dubai. You can see it from well over 80 km away on a clear day. Tourists having no business with any of the tower’s tenants can enter Burj Khalifa by going up to the observation deck, called “At the Top”, by paying an entrance fee of AED125. At the Top is not exactly located at the top of Burj Khalifa. It’s instead located on 124th floor which is about 452m above the ground. That’s about the same height of Petronas Twin Towers. And yes, there’s an open air deck too on that floor. Crazy? Probably. The view from up there however is amazing! If you want to go to At the Top and pay only AED125, you better buy the ticket ahead online for the time that you want. Else there’s a good chance that you might have to pay AED400 instead if you just show up and buy a ticket to enter right there and then. 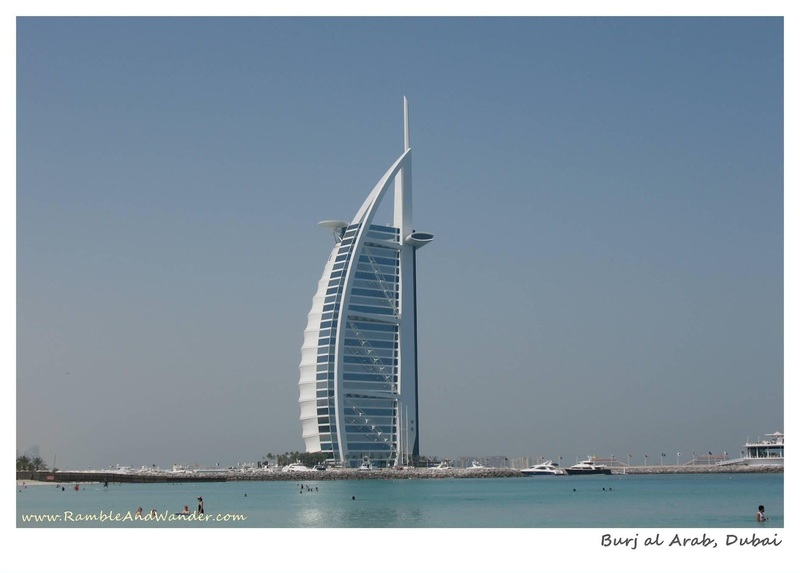 (The AED275 that you saved here can be used to go have a meal at Burj al Arab, the 7-star hotel, instead. More on that later). Burj Khalifa is not the only attraction here though. Right next to it is Dubai Mall, one of the largest shopping malls in the world. Apart from the usual suspects, you can also expect to find Bloomingdale's (the New York department store) and Galeries Lafayette (the Paris department store). And right next to both Burj Khalifa and Dubai Mall there is a lake where you can enjoy amazing musical fountain shows every day during lunch hour and in the evening as well. For a lot of visitors, the fountain shows are one of the top highlights of their trip to Dubai. To get the idea why, just check out the videos. Visitors usually combine all these three attractions in one go. They spend an afternoon at the mall, followed by a trip up to At the Top in late afternoon in time for a sunset view of Dubai and beyond. This is followed by an early dinner by the lake while enjoying the musical fountain shows. This is supposedly the best thing to do while in Dubai. You get picked up in a 4x4 and driven to a desert just outside Dubai for a rollercoaster-ride-like dune bashing. Definitely not for the faint-hearted. This is usually followed by a free camel ride, sunset watching and dinner with some belly dancing as an entertainment. The most popular desert safari usually takes place in the afternoon. You get picked up at around 3 in the afternoon and dropped off back at the hotel at around 9 in the evening. Due to the nature of the ride, it is advised not to have heavy lunch beforehand. The cost of the safari varies based on the companies and this can range from anywhere around AED100 to well over AED300, which should suit almost every budget. There is no need to book in advance. You can just check with your hotel concierge or any of the bigger shopping malls in Dubai. 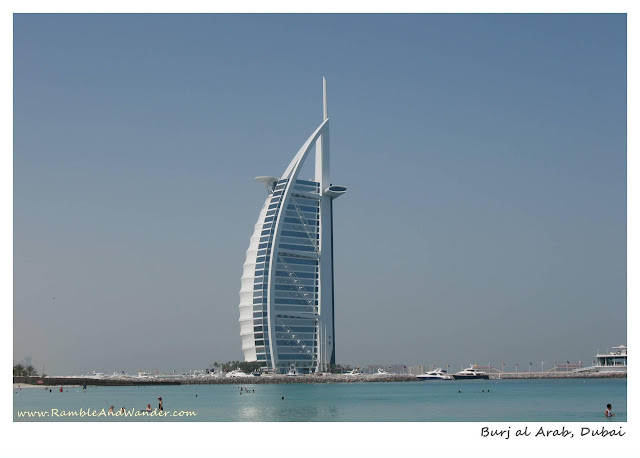 Okay, Burj al Arab is a hotel, a 7-star hotel, and said to be the only 7-star hotel in the world. That’s not the truth though. It’s a 5-star luxury hotel but since almost everyone says that it’s a 7-star hotel, it is now known as a 7-star hotel. A very exclusive hotel where you cannot simply barge in without any room booking or table reservation at one of its restaurants. If you feel like going in there, you may use the AED275 that you saved at Burj Khalifa. Make a reservation at one of the restaurants in advance, and expect to pay at least AED200. There is however a relatively cheap meal in the form of a 7-course afternoon tea that costs just AED275. If you don’t want to spend any money at the hotel but would like to take a photo of you with the hotel in the background, head over to the public beach next to Jumeirah Beach Hotel or Madinat Jumeirah Souk, an up-market modern souk located not far from Burj al Arab. P.S: The above photo was taken from the public beach. This is the old Dubai. In Bur Dubai area, there’s Al Bastakiya (an old settlement area by the Creek which is now turned into restaurants, cafes and museums area). There’s Dubai Museum, textile souk and an old palace of the ruling family which has been turned into a museum. The souks around this area are the place where you can buy your souvenirs cheaply. This is also the place where you can enjoy the sights of small boats, abras and big dhows plying along the Creek. 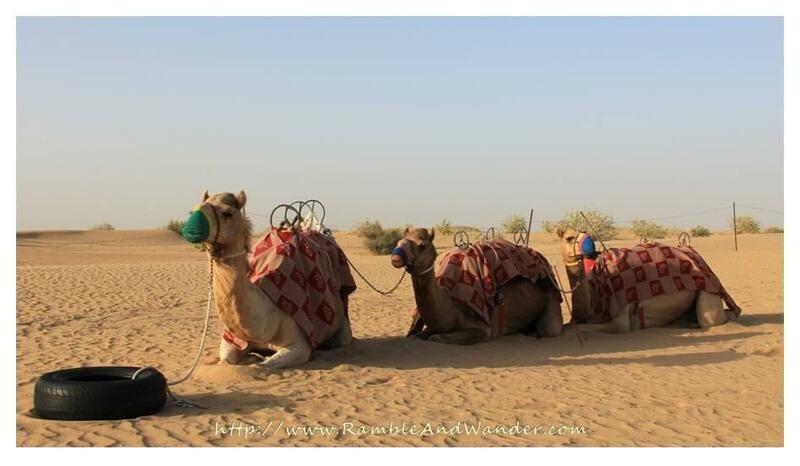 Read the blog post here: UAE: Camel Burger! If you're interested to learn more about Emirati culture (including food and religion), head over to Sheikh Mohammed Centre for Cultural Understanding (SMCCU) in Al Bastakiya area for a meal and/ or a chat. They also conduct Heritage Tours and Mosque Visits. Palm Jumeirah is one of the 3 man-made palm-tree-shaped islands and is the first that is (somewhat) completed. It’s filled with hotels, villas and apartment buildings of the rich and famous. (A few international stars including some famous footballers apparently do own a villa or two here). Of note is Atlantis Hotel, a water-themed hotel, which is made famous the world over following its extravagant launching ceremony. Its waterpark, Aquaventure, is quite popular among local residents and tourists alike. While the elevated view from the monorail which runs along the “trunk of the palm” is nice, you might get a better view of the palm-tree-shaped islands from some nearby high-rise hotels. One the recommended places is The Observatory Restaurant, which is located on 52nd floor of Dubai Marriott Hotel. There is also now a boat cruise trip around the Marina and Palm Jumeirah that is managed by the Roads & Transport Authority (RTA) of Dubai if you'd like to see this unique development area from water. Click here for details. 6. Mall Visits - Mall of the Emirates, Ibn Battuta Mall, etc. Dubai probably has too many shopping malls already but new ones keep popping up. To compete, all the malls try to differentiate themselves by having unique attractions and themes. Mall of the Emirates, the largest shopping mall pre-Dubai Mall days, have Ski Dubai. 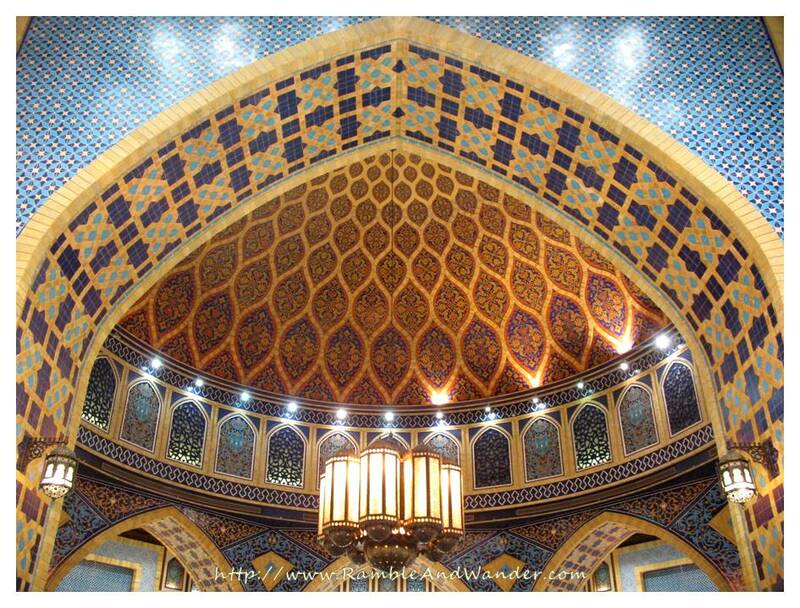 Ibn Battuta Mall boasts a marvellous architecture that is based on the travels of Ibn Battuta. You’d feel like you’re walking from Morocco to China as you walk along the mall from one end to another. Other notable malls with unique themes and/or attractions include Wafi Mall (Egyptian Pyramids concept and theme), Dubai Festival City, and Mercato (Italian themed). Times Square Mall, while not exactly popular among tourists, has an ice bar (Chill Out Bar). Every year for about 3 months during the winter months (Nov - Feb) in the UAE, Dubai hosts an event called Global Village where at least 40 countries from all over the world set up pavilions and promote both their countries and products. Apart from shopping and tourism promotions, there are restaurants, cultural shows and funfair areas as well, making it a perfect place to go for a family outing for a taste of what the world has to offer. Abu Dhabi is a neighbouring emirate to Dubai. The capital city of the UAE, Abu Dhabi, is located in Abu Dhabi emirate. Being the capital, it has a lot to offer to visitors as well but perhaps three of the most popular destinations in the emirate of Abu Dhabi for a day trip from Dubai are Sheikh Zayed Grand Mosque, Yas Marina Circuit and Ferrari World. For art lovers, fret not, Abu Dhabi would soon also have world class museums, Louvre Abu Dhabi and Guggenheim Abu Dhabi. You can take a taxi to travel to Abu Dhabi but the cheapest way would be to take a bus from either Al Ghubaiba Bus Station or Ibn Battuta Mall Bus Station in Dubai. The ticket is around AED25 each way. Sharjah is also a neighbouring emirate to Dubai, a more conservative and Islamic emirate (for example, alcohol is not sold in the emirate). It is however located very close to Dubai, making it a perfect place to visit either for a day or half-day trip from Dubai. Among the more popular destinations in Sharjah includes Arabian Wildlife Centre, Sharjah Art Museum, Qanat al Qasbaa and Sharjah Classic Car Museum. Sharjah is easily accessible by taxi and bus. The journey can take as short as 15 minutes or as long as 2 hours (or even longer!) depending on your location in Dubai and traffic status on the roads between Dubai and Sharjah. It is therefore best to avoid travelling during peak hours when residents go to and come back from work. What do you think of the list? Care to share with us your thoughts on the above places? And if you have been to Dubai before, what other sights do you think are also a must see? 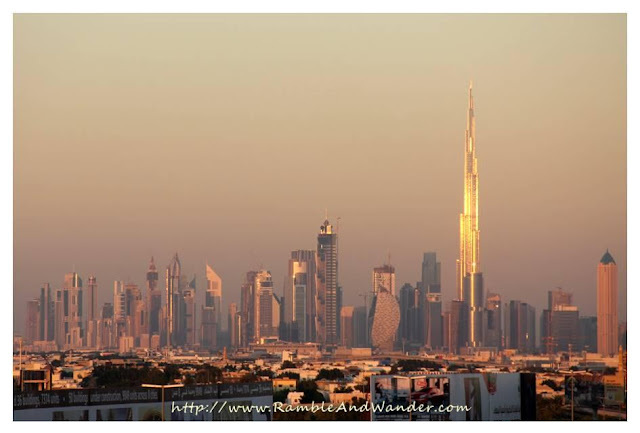 If you're looking for a relatively cheap hotel to stay at in Dubai, you may read here. I have been to most of the places that you mentioned above and met wonderful people there. I have been to Abu Dhabi, Dubai, Ras Al-Khaimah and Sarjah. I really want to revisit the beautiful places and my friends over there. Waah! You've been to 4 emirates already. I haven't been to Ras al Khaimah actually. How long were you there or did you cover them over a few trips? ARGHHHH...!!! !, pengen ke Dubai, perlu budget berapa bang? Kalo bisa couchsurfing, bajetnya cuma tinggi sedikit aja dari KL. Yg bikin mahal itu accommodation. Hostelnya juga mahal walau hanya hostel. Bole host teman ka R.a.W? Flight to dubai itself is sooo soo sooo expensive... any recommendations of cheaper n reliable airlines to dubai? Currently there are good promo out of Singapore to Dubai. 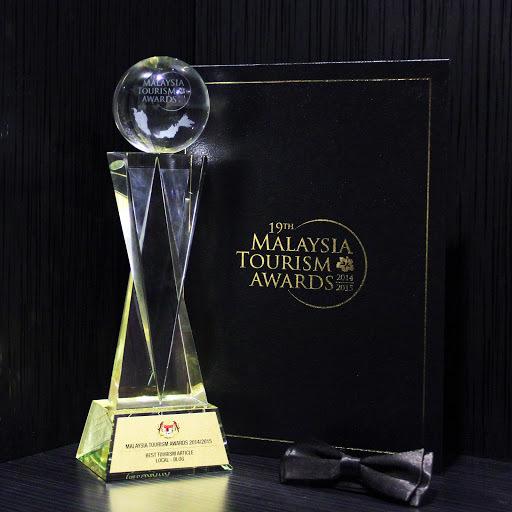 ~RM1200 with Malaysia Airlines & ~RM1400 with Emirates. Out of Kuala Lumpur, cheap option usually is with SriLankan Airlines or via Sri Lanka with 2 separate LCC airlines. Hi R.a.W....in your opinion when do you think the best time is to go to Bur Dubai and Deira and how long to stay there? I was thinking of going there in the morning and then onto Dubai Mall for about 2'ish followed by the Khalifa at 5'ish. Do you think this is feasible as I have no idea as I have never visited. You also mentioned the new boat system as a way to see the Atlantis from the water, do you think this is better than the yellow boats in your opinion? If you have only one day for the Bur Dubai, Deira & Dubai Mall/Burj Khalifa, yes, it is certainly feasible, as long as it's not on a Friday. Because on Fridays, the souks in Bur Dubai & Deira only started to open in the afternoon. If you start early, say around 8, 8.30 AM, and walk around the area at a leisurely pace, you'd have plenty of time before you need to leave for Dubai Mall at 2. You probably can have lunch by the Creek even, if the weather is nice, i.e. not too hot :-) Burj Khalifa at 5-ish sounds okay but if you're going for the sunset, do check the sunset time and maybe try take the slot 30 minutes or even 1 hour before that, to allow for security check. Sometimes there can also be a long queue inside waiting for the elevator to go up. Once you're up there, you can stay for as long as you want but people usually stay for around 1-1.5 hours only. With regard to the yellow boat, I haven't actually tried either but looking at both of them, and the fact that you want to see the Atlantis, the Yellow Boat is much more expensive (min AED200) while the RTA boat is at either AED50 or AED75. The latter could be a shorter trip though, and they depart at fixed hours. RTA boat is also much bigger, with the ability to accommodate up to 100 passengers whereas the Yellow Boat could turn out to be more of a personal experience. So it really is up to you depending on the budget, the kind of experience that you'd like and whether or not you're okay with following the fixed schedule. Hope that helps a bit :-) and I hope you'd enjoy Dubai! This helped me loads thank you. The plan you suggested for Bur Dubai, mall and Khalifa sounds great. I did hear sunset in Nov is around 5:30 pm but I will check again in Oct before I purchase my ticket. I will also check out the water boat you mentioned as I didn't realise it was so much cheaper but just to let you know just in case the question pops up there Yellow boats do a 2 for 1 in the Entertainer but I am going to compare the 2 as I don't really need the personal touch as such but just the water view. I am officially a fan of yours, keep up the good work. Aah so you're going there in Nov. The weather should be nice at the time. Nice time to have a stroll along the Creek and a lie on the beach too maybe. I would usually recommend Entertainer for those who are going there for one week or more because the book itself is quite expensive so need to make sure that it's worth the money. But it is good if you plan on utilising some of the 2-for-1 vouchers for both attractions and dining out. If there are a few people travelling with you, then you can easily achieve this. Personally I think Dubai can be done in 3 days, especially if it's just a stopover on the way to another destination. It may be a slight rush though. Visitors tend to stay longer for the beach and maybe a trip out of Dubai to Abu Dhabi, Sharjah and/or Musandam in Oman. Love reading your blog - describing places that are really interesting, illustrated by great photos. Syabas!